Roast Chicken, cooked in the slow cooker is such a great idea for an easy dinner; and you just might have leftover chicken to use in a variety of ways! Winner, winner, chicken dinner! I’m not sure how many people make roast chicken at home, now that every grocery store (and COSTCO!) sells inexpensive roast chickens that are really quite tasty. But the thing about roasting your own chicken is the amazing smells that fill your house while the chicken is cooking! 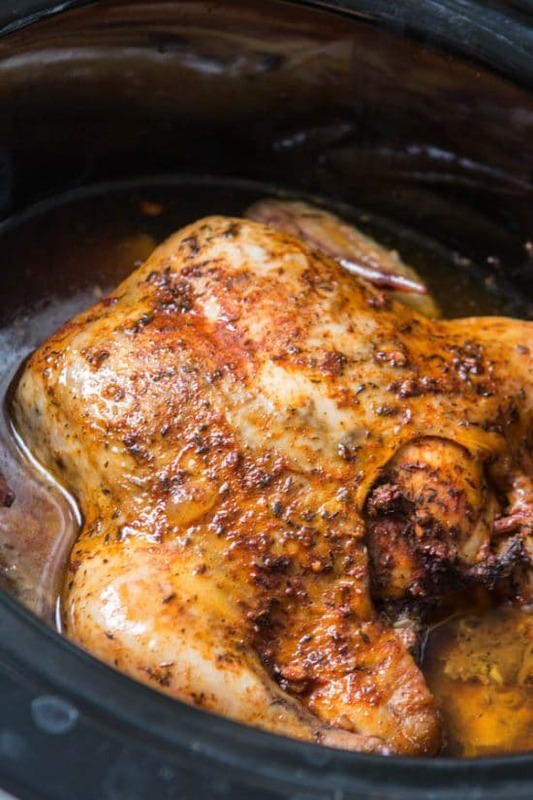 This is the second recipe we’ve featured for roast chicken in the slow cooker, but this recipe for Tender Slow Cooker Whole Chicken from Sweet Basil is actually quite different than the earlier one, so I thought it was an idea worth repeating. And this recipe produces fall-apart tender chicken, so it might also be a good starting point when you need leftover chicken for another recipe. Get the complete recipe for Crock Pot Roast Chicken from Sweet Basil. Thanks for posting my recipe! You're the best. If our crockpot hadn't died a few weeks ago I'd for sure try some different variations. Oh well. Oh dear, I could not get along without my crockpots. Hope you get a new one soon! I have yet to try cooking a whole chicken in the slow cooker, so thanks for inspiring me. Will try this in the next few days!